I have been a conservative for my entire lengthening life. I Blogged for Huckabee last primary season, and for McCain in the general election. But for the years of George W. Bush’s first term, I actually took a hiatus from my lifelong Republicanism. I’ve more frequently been found in the past 6 years, defending Bush from unjustified and unfair criticism. But, I never supported him as a Presidential candidate. In Texas, I had voted for him for Governor, but opposed him as a Presidential candidate in the primaries in 2000 and again in 2004. Actually, of the 14 original Republican candidates in 2000, I had only favored McCain less than Bush. But I came to regard that as a mistake. McCain was not thoroughgoing in his conservatism. I mostly detested his advocacy for his unconstitutional idea of “campaign finance reform.” But there is no way that McCain would have presided over anything like the kind of spending that Bush did. He would not have initiated it, and if Congress had passed such to him (they wouldn’t have; they rolled over for a Republican President Bush), he would have been vetoing it. Similarly, though McCain had voiced sympathy for carbon control (ugh), he would never have supported the massive taxation of cap & trade proposals, which he has strongly opposed. When Bush’s win was confirmed, I emailed to my conservative list and a conservative list-serve, “Leviathan gets a night manager.” And with a Republican Congress for 6 of his 8 years, spending and government grew at a faster percentage rate than it had since Lyndon Johnson in the 60s. I wasn’t psychic. I had seen his lack of a restraining anchor in Texas. Like his father who “was not big on the vision thing,” he was a sober patriot administrator who was susceptible to general opinion about what was good and necessary. It irritated Republicans when I said that if Al Gore, who of course would become Almer Goretry the climate change huckster, had actually become President, he could not have done as much damage as Bush did domestically. A Republican Congress would never have spent like that for Gore; even expanding the Medicare entitlement. You can suppose that Gore would not have been as assertive against terror. But he might have. He was its biggest spender when he was in The Senate, voting for everything both domestic and Defense. At that time, I also did a stint with The John Birch Society. I had subscribed to National Review as a teenager, but had no recollection of William F. Buckley’s old dismissal of The John Birch Society. Upon his death in 2008, Commentary Magazine published Buckley’s account of a meeting of prominent conservatives to disavow The John Birch Society, and my own experience was of the same persistent inclination that Buckley noted back then. Buckley wrote that when asked how he would define The Birch fallacy, “The fallacy,” I said, “is the assumption that you can infer subjective intention from objective consequence: we lost China to the Communists, therefore the President of the United States and the Secretary of State wished China to go to the Communists.” Birch founder Robert Welch had described President Dwight David Eisenhower as a secret agent of the communists. They were good and decent people, and their magazine, The New American contained some of the most competent writing I had read since those earlier days of National Review. But I soon saw the insistence on identifying an extensive conspiracy even in people who happened to stumble in their innocence into a mere note of consistency with socialist aspirations. They usually don’t, but even if all the people they charge with them, had such grand aspirations to overturn the system, they generally don’t have the power or competence to begin to do it. Barack Obama has inflicted considerable change. He’s 1 in a billion. But a correspondent recently posted an article on Ron Paul’s web site which was most of one from 2 years ago in The New American about Newt Gingrich’s deviations from constitutional principle. Old feelings came back both from The John Birch Society and that conservative third party, which was made up of wonderful Christian people. And all of the preference for constitutional scrupulosity had merit in the abstract. But we do not live in the abstract. In the reality where we live it has relevance only as an ideal. To demand a strict adherence to it is not only inadequate cause for disparaging an individual’s character, to in fact apply it is to be utterly divorced from reality and of no consequence to actually bettering a society that does not even comprehend it. Judge as you might how skillfully Gingrich has balanced The Constitution with reality as it is, but he is attempting to actually wield an influence on a society that is far off the constitutional rails. The John Birch Society wields practically none. And it’s because they won’t come out of their purist cave. Like I said, hold up an ideal, but you have to be able to reach people where they are. I know how these things work and that Paul partisans or any JBS members will ignore what I just wrote and take me to have endorsed ignoring The Constitution. But I am a constitutionalist and just wrote that it should be held up as an ideal. But to express yourself in strictly constitutional terms to our current society is similar to speaking Greek to them. They don’t get it and certainly don’t appreciate it. And the net effect is like that of a muscle-bound body builder, flexing before a mirror for the satisfaction of himself and possibly other body-builders. But nothing is ever applied to actually building or moving a thing. Ron Paul runs for President and his supporters boast of a growing movement. But though his supporters are disproportionately active, I would judge the likelihood of his nomination as in the neighborhood of zero. I understand: I have been an unrealistic idealist. Paul’s biggest problem is his naive and dangerous foreign policy. Without that I’d strongly agree with him, though his presentation is didactic and non-charismatic. But this article scalded Gingrich as an unconstitutional phony conservative. Well to begin with Newt Gingrich and Ronald Reagan are the most accomplished conservatives of our lifetimes; at least since Calvin Coolidge in the 1920s. Reagan reduced taxes and unleashed a long period of growth in incomes and Gross Domestic Product, while financially exhausting The Soviet Union and forcing Gorbachev and The Soviet Union to reforms. And the repeated presentation of the Gingrich engineered and led first Republican Congress in 40 years politically forced Clinton to sign welfare reform after almost 60 years. And though the compromise with Clinton raised the top marginal individual income tax rates, it more importantly included a reduction in the capital gains rate. On the whole, this made it more profitable for the wealthiest individuals to keep their resources invested than to take it as personal income. And the resultant economic growth along with the spending restraint of the new Gingrich-led Congress, balanced the budget in 1998, for the first time since 1957, over 40 years before. These are the biggest conservative accomplishments, maybe since the first Republicans freed slaves and passed the 14th Amendment which charged states to grant equal rights to all men. This is a moral republican principle, representing a common representation of all the people, rather than a purely democratic on in which a majority tyrannizes the minority. Meanwhile the accomplishments of The John Birch Society and conservative third-parties: zilch. All of the conservative criticism of Gingrich is of the same sort, seizing on particular elements without looking at his overall accomplishments or acknowledging his life changes and admission of past foolishness. The overall picture is that Gingrich is a very accomplished and capable conservative operating in a popular culture environment that has been generally hostile to that. He has been so effective that he has been well paid as a consultant. That is waived as a negative. But how has he worked against conservatism for money? Are conservatives now supposed to be opposed to someone being paid for their abilities? The infamous public service spot with Nancy Pelosi acknowledging the need to address “climate change,” I think offers a stark example of how Gingrich has sometimes operated. It was made at the time when the pitch had made its deepest penetration with the public. Private companies were even starting to pitch “green” products and claims of reduced carbon emissions; a sure sign of where public opinion had gotten. 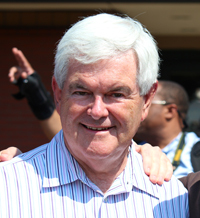 Gingrich wanted conservatism included in the conversation that the public was interested in, and seen as genuinely interested in the environment. But he contested cap & trade and was never a part of any carbon emissions regulation. Even today when asked whether he believes that humans have a part in affecting the climate, he says that we and he don’t know. I don’t know if he really hasn’t studied the data or still doesn’t want to turn people away. But I have looked at the historical graphs of temperature and carbon in the atmosphere. In fact, temperature trends precede carbon changes, and the actual evidence for anthropogenic climate change is less than dubious. But in any case, I don’t expect politicians to pore over scientific data, though they should sure get the thoughts of (real not propagated) broad scientific opinion before imposing laws or regulations on the people. I don’t agree with the opinions of the long-toothed political pros that Romney would best appeal to Independents and be the best candidate for the general election. If Independents are looking for someone who isn’t baldly partisan, they are not looking for someone who is ambiguous. I think these old Republican “experts” still labor under the old fear of appeasing a liberal press and the public that is hostage to their opinions. But they are not quite so hostage any more. We’ve developed talk-radio, pay television, and now the Internet. Gingrich has a far superior record of accomplishment and is far better gifted to engage the battle. Yes, he has a long record that will be attacked. But A) he’s better able to respond. And B) we shouldn’t kid ourselves about the ferocity with which any Republican nominee will be attacked. That includes Romney. And I really think he is ambiguous in terms of a clear perspective according to which he can respond. I’ve watched him for years, and watched him for the entire 2008 campaign season. He can streamline an existing organization. But he’s unclear on cultivating the ground to produce new ones. I’d be comfortable if I could install Rick Perry as President, who understands federal intrusion on state jurisdiction and has the sense to keep government as much out of the way as possible. But I’d certainly rather have Gingrich on the road to The White House and navigating the political obstacles of Washington with innovative ideas. I think Gingrich is a matured man who wants the opportunity to restore the unique character and potential of America. I’m not sure exactly what some fear, but I want to give him the ball and would bet on success rather than failure. What is it about the real world makes Gingrich take $1.6 billion while shilling for Freddie Mac to be bailed out, virtually a direct transfer to him of taxpayer money? This is unreal. Gingrich isn't remotely Constitutional nor even principled but unConstitutional. He only talks a good game. Newt Gingrich is a fan of author Alvin Toffler, who believes that our American system of government­, which was designed by the Founding Fathers, and which is protected by our Constituti­on, has become obsolete, and needs to be discarded, and re-designe­d. According to Toffler (and Newt), “It needs to die and be replaced.” Newt once boasted that in order to understand him, you needed to read Toffler’s two books, The Third Wave, and Creating a New Civilizati­on: The Politics of the Third Wave. When Newt Gingrich became Speaker of the House, he recommende­d reading Toffler’s books to all of his colleagues­. He wrote the forward to Toffler’s last book, The Politics of the Third Wave. Those are Newt’s very own words. That sounds about as close to a regret that we have a Constituti­on that I have ever heard any politician say!